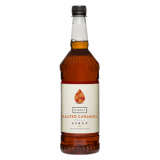 Salted caramel syrup 1 litre plastic bottle. Sweet and salty, who would have thought this would be super delicious?! Now a popular flavour in desserts and ice-creams, it's a sweet and savoury delight. 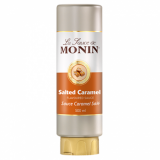 Designed to flavour drinks such as coffee, hot chocolate and frappes. Versatile - use in baking, cocktails, desserts and sauces. Free from high fructose corn syrup. 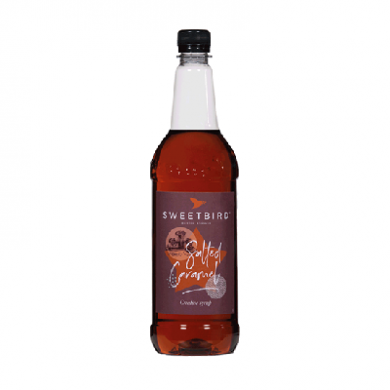 The Sweetbird brand of syrups, sauces and smoothie mixes was created by Bristol-based company Beyond the Bean. The Sweetbird range is free from high fructose corn, artificial colours and is vegetarian and vegan. Beyond the Bean have come a long way from their humble beginnings in 1997 when the whole business operated from their home-office and their customers were a few small coffee bars in Bristol. They now operate in 50 countries and occupy a large warehouse facility, filled with syrups, smoothies, hot chocolate and frappes - pretty much everything for a coffee shop apart from the beans! Today Beyond the Bean remains entirely independent - Jem and Nikki still own, and love, the business they built from scratch. They are supported by the fantastic team at their HQs in Bristol and Los Angeles - a team full of knowledge and passion for the Beyond the Bean range. slucose-fructose syrup, sugar, water, salt, natural flavourings, acidifier: citric acid, colour: plain caramel.